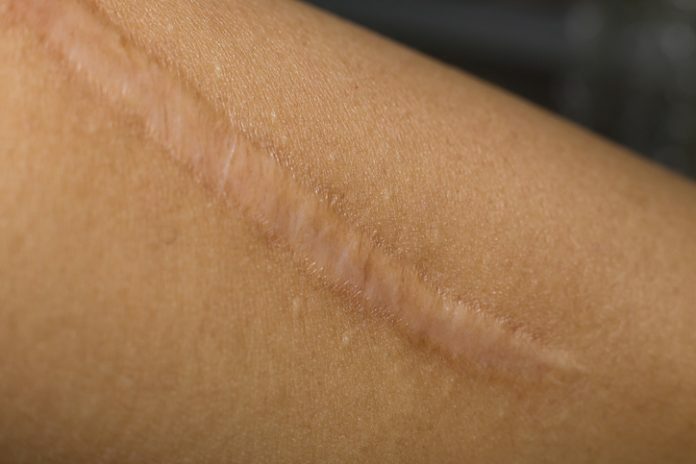 We all stand the risk of accumulating scars throughout our lifetimes, but curiously, in old age, the likelihood that a wound will leave a thick, ugly scar is much reduced. How older skin is advantaged has been unclear, even though dermatologists and plastic surgeons have consistently observed that older people’s wounds heal with thinner scars. A new study, however, has exposed the role of a blood-borne stromal factor in scarring. The study suggests that suppression of this factor, which is expressed by the SDF1 gene, could improve tissue regeneration. The article describes how a team of scientists based at the University of Pennsylvania (UPenn) School of Medicine pierced the ears of mice of different ages—the equivalent of a 12-year-old and a 70-year-old if converted to human years. The hole closed with no scar formation in older mice, while younger mice healed with a visible scar. Researchers then exchanged the blood of young mice with old mice, pierced their ears, and found that the ears of old mice now scarred. They concluded whatever was causing the scarring must be something in the blood. The team then took tissue samples from young and old mice and compared their gene expression signatures. They identified 80 differences, too many to study. But when they asked which gene products are found in the bloodstream, the list narrowed to 13 suspects. One was SDF1, a signaling molecule that was previously shown to play a role in scar formation in the skin, liver, and lung, and it seemed like a promising possibility. They confirmed that SDF1 was expressed in younger mice but not older. To prove that SDF1 may be the causal factor, they created a mouse that lacked SDF1 in the skin. When SDF1 function was inactivated, even young mice began to regenerate skin, behaving, in this sense, like older mice. EZH2, the team found, modifies the DNA at the SDF1 gene and prevents the gene from being activated. “As the mice aged, we found more EZH2 at the SDF1 gene,” Dr. Leung explains. By using a drug to block EZH2 function in elderly mice, the scientist saw that these mice regained SDF1 induction and lost their ability to regenerate their skin. Dr. Leung notes that this work has the ability to impact the clinic relatively quickly. SDF1 inhibitors already exist on the market and currently used as a treatment to mobilize stem cells. He and his team plan to study its use in preventing scar formation in humans.